Brandon Far North Top is the third highest mountain in the Brandon Group area and the 24th highest in Ireland. Brandon Far North Top is the most westerly summit in the Brandon Group area. Critchley and Schwartz deserve to have this peak named after them because in Easter 2015, during their three day trek over the ridge, the duo took out their measuring equipment and declared the place a Vandeleur Lynam. Normally I become agitated at the thought of folks adding new peaks to my lists, least I have to go back and "do it all again" but on this occasion I was delighted as i had already been there in August 14. The still shows the pair on the way up to BFNT from Masatiompan and Piaras Mor. I love that long narrow ascent. On your left (east) you have the wonder of Brandon Bay and Castlegregory. On your right (as per the film still) you have the glory or Ballydavid Head and the Blaskets. 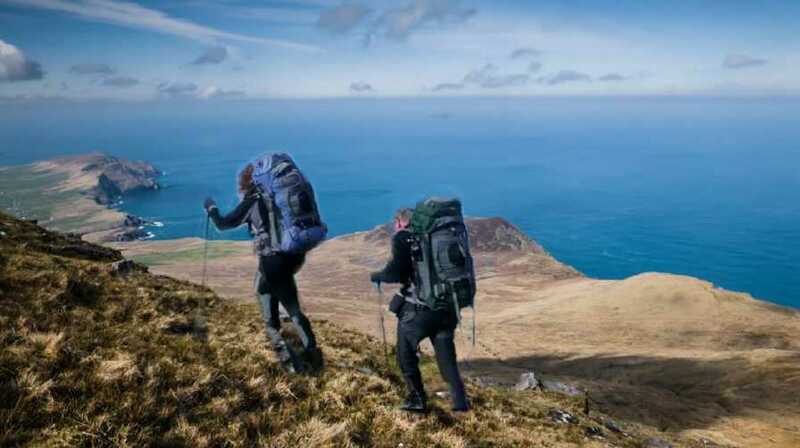 One of Ireland's greatest walks, and a film that does it justice.